Sweet Pickle Designs: Hooray! A Giveaway!!! and she's going to do a giveaway of a set too! I'm alive and well, but a little busy. But here's a few fun things I've been up to! Just in time for the Fall are these cute AUTUMN letters! I miraculously found some more of the paper!!! I absolutely love these Fall letters! So now I'll have a few sets to put on Etsy and do up for the boutiques! If you are interested in a kit just give me a holler! 7 Hours of uninterrupted CRAFTING!!!! My little girl is officially starting 1st grade! Yikes!!! and so ready to get goin' on them! 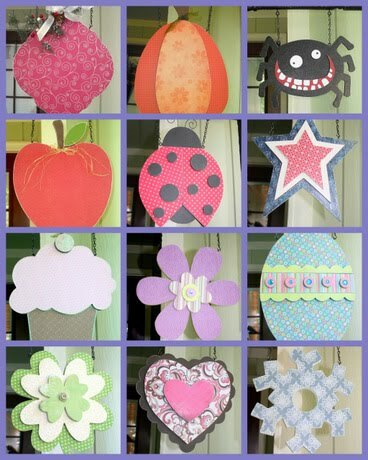 which is great since those are my favorite Crafts to make! So stay tuned and hopefully I'll post pics as soon as I get em' done! cute stuff as always!!! Can't wait to hear where your boutique is :) Hugs!